Mother Goose Story Time at the library is a fun time for all! On Saturday my husband, son and I hosted a little holiday party at our local library to enjoy a Mother Goose Story Time. Since this was on a Saturday & some people have the day off work, I invited moms to bring their husbands along as well. It was nice to have a little holiday group activity to include the entire family. 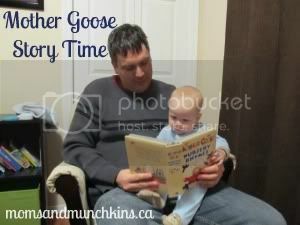 If your library doesn’t offer a program like Mother Goose Story Time, you could always call and ask if someone there would be willing to start one. The library is always looking for fun ways to encourage children to read. Or perhaps you or someone in your group has an outgoing personality and would like to organize something like this for your moms group. Your local dollar store is a great place to find inexpensive books, puppets and sing along CDs. For more fun ideas to enjoy as a family, follow along on Facebook. We look forward to seeing you there!